Heart ‘n Home Hospice & Palliative Care was awarded The Best of Treasure Valley ™ 2019 in home care by Inbound Systems! The Best of Treasure Valley introduces a new way of identifying and recognizing the best businesses in the community. Using a combination of online reviews and community votes, winners were determined across nine categories and 184 subcategories. More than 18,000 unique ballots were cast during the voting round by Treasure Valley residents. Local businesses and attractions were nominated last fall and the top 10 nominees in each subcategory moved on to the voting round in October. In addition to votes, online reviews from Google, Yelp, and Facebook were included in the scoring. Overall ratings and the number of 5-star reviews from the previous 12 months helped determine the winners. “We were very humbled by not only the nomination and being a finalist, but to win best in class is truly an honor. Our staff ‘Embrace Innovation’ so that we will be relevant in the future, on the cutting edge of cares, yet timeless in how we love and care for our patients and their families.” Said Todd Stice, Heart ‘n Home Co-President. 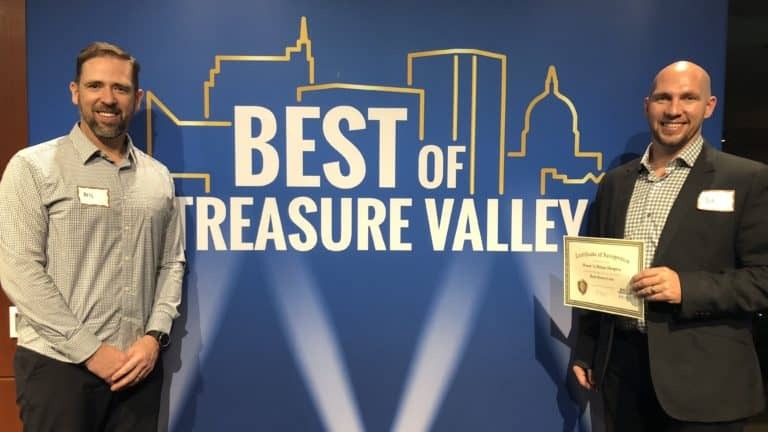 Heart ‘n Home, amongst the other category winners, were announced at the Best of Treasure Valley Awards Banquet, held on December 4th, 2018 at the Zion’s Bank Ballroom. Heart ‘n Home affirms life by providing emotional, physical, and spiritual support to our patients and to those who love and care for them. Heart ‘n Home is a family owned and operated company and serves 11 counties across Oregon and Idaho. To learn more about our end-of-life services visit www.gohospice.com.